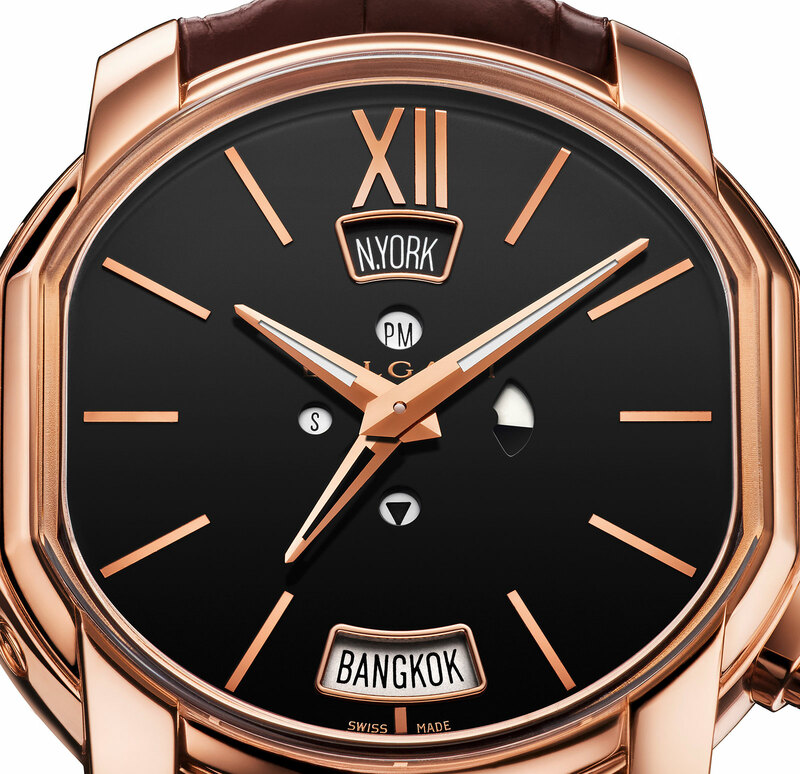 The latest from Bulgari is a wristwatch that combines several various travel watch complications, making it an extremely comprehensive travel watch, though one that is not entirely new. 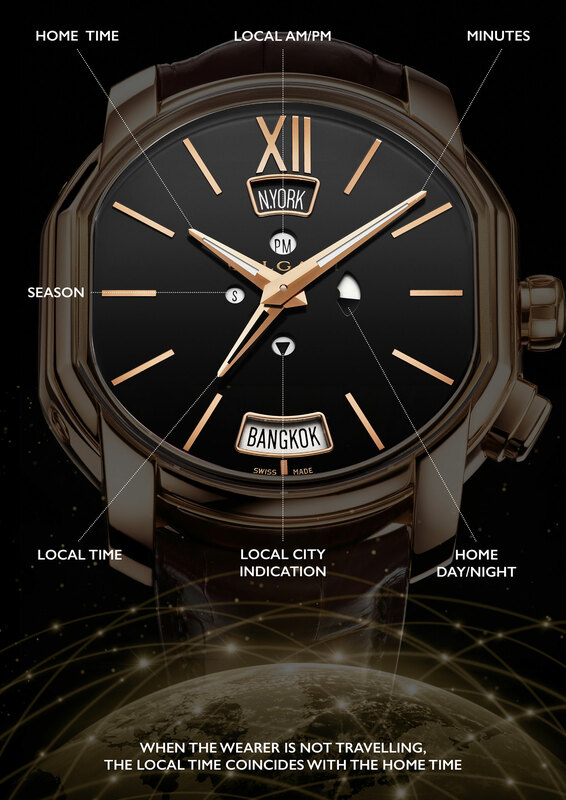 Time is indicted by the central hands, with the white Super-Luminova-filled hands showing local time, while the open-worked hour hand shows home time. An arrow at six o’clock points to the city that represents the current local time zone, while separate indicators show day and nighttime for both the local and home time zones. A pusher at four o’clock advances the local time hand by an hour. More unusual is the daylight savings time (DST) function that shifts certain time zones forward during summer can. This has to be done manually via a pusher at eight o’clock, and is indicated in a window at nine o’clock when in use. Not many watches account for DST, and one of the few others that do is the Glashütte Original Senator Cosmopolite. As for the name, Hora domus is Latin for “home time”, but rendered with a Latin alphabet “v” for Hora Domvs, which is also how Bvlgari styles itself. 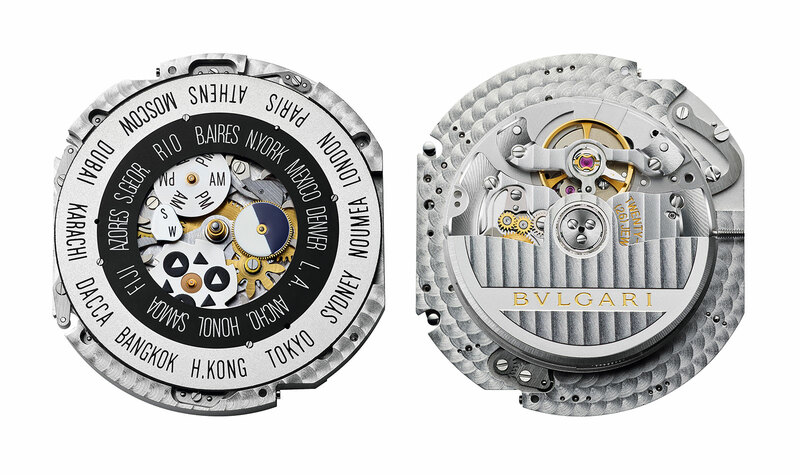 The base movement is the BVL191, an automatic movement made in-house by Bulgari. The module with the clever time zone display is also in-house, but not a new. 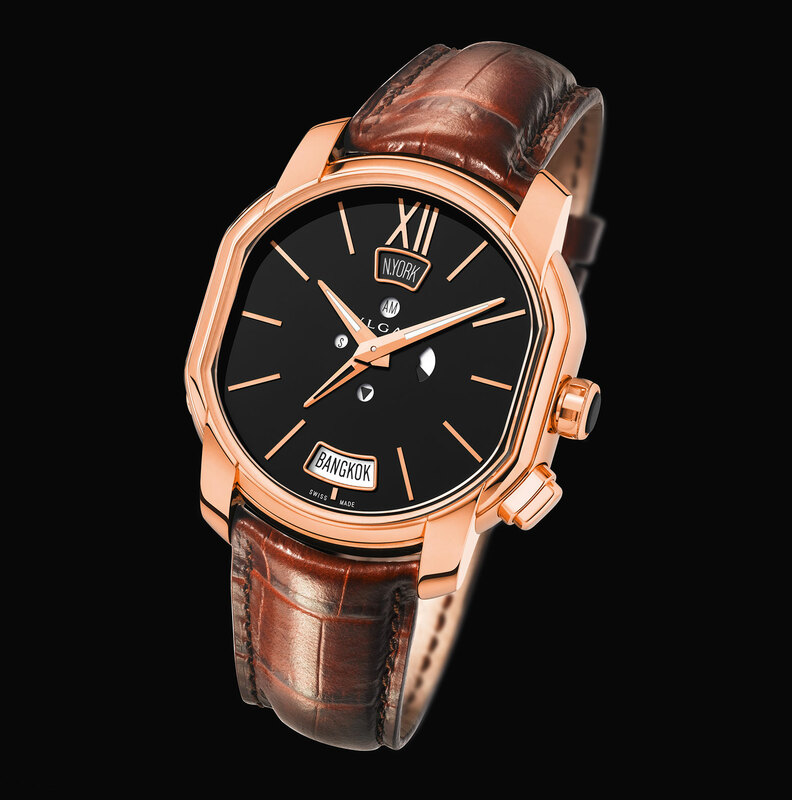 Like many of the other complications offered by Bulgari, the mechanism was originally developed by Daniel Roth, and launched as the Metropolitan in 2006. The Italian jeweller acquired Daniel Roth and Gerald Genta in the year 2000, gaining their expansive library of movements and complications. Bulgari then merged the two brands into its own line of watches, while ensuring many of the two brands’ best complications persisted. The recent Bulgari Octo Finissimo minute repeater, for instance, reboots a Gerald Genta movement from the 1980s, proving perhaps that good things last a long time. The Hora Domvs is a large 45mm in diameter, with a “box-shaped” sapphire crystal. 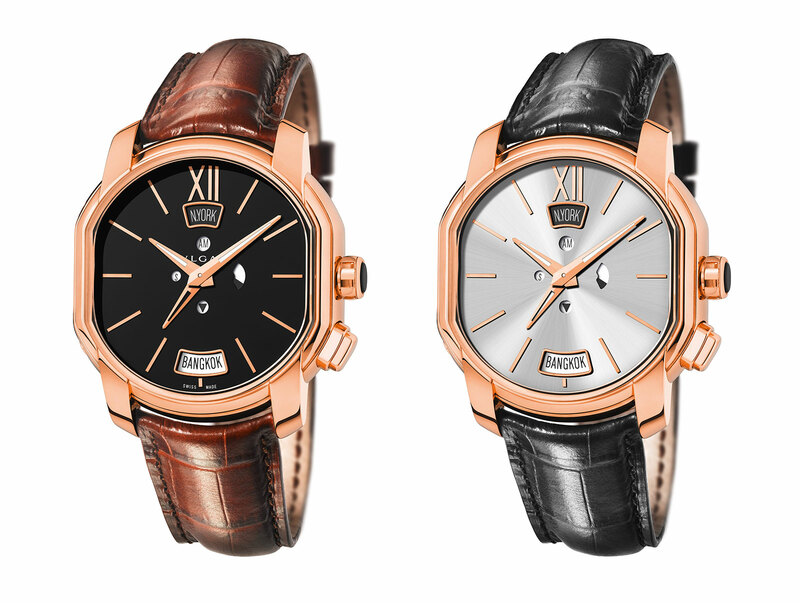 It’s only available in pink gold with either a black or silver dial. The watch will be available starting October 2016, with a price tag of SFr34,700 or S$51,500. Louis Vuitton gives its ovoid case form a second time zone movement and a relatively affordable price tag with the Voyager GMT.